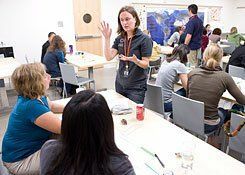 Continuing Education: Jill Bible, curriculum developer for the Teacher Institute on Science and Sustainability, at the California Academy of Sciences, explains a science experiment to teachers in a weekend workshop. The youthful visitor straining to see exotic fish or Costa Rican butterflies in one of the many new exhibits at the San Francisco's California Academy of Sciences may be having too much fun to realize the crucial role education plays in all he or she is seeing. In fact, the needs of California's students and teachers inform every exhibit, every descriptive label, even the Academy's Web site and brochures. Megan Schufreider, manager of student services, puts it another way: "Most kids will come only once a year to the museum on a field trip. But when we engage teachers, we're reaching kids many more times throughout the year." To achieve that goal, the members of the Academy's education department have launched several new initiatives. The first session of the Teacher Institute on Science and Sustainability (TISS) will begin this summer, and it will allow selected teachers in grades 3-5 to participate in a two-year professional-development program. The program, which pays a $2,000 stipend, centers on a two-week summer session that features off-site field studies and Academy-based all-day workshops, plus 42 hours of workshops and independent study throughout the two-year term. Academy scientists will mentor participating teachers, assisting them with independent-study projects and observing their practices in the classroom. "The Academy reinvented itself to put sustainability issues front and center," says Helena Carmena, manager of teacher services. "We want our teachers to become stewards of the environment, too." Teachers can apply to the institute online or by emailing TISS manager Grahme Smith. Welcome, Teachers: Helena Carmena, manager of teacher services (far left), and Guest Services staff prepare for a Saturday workshop at the Academy. For those with limited free time, the Academy also offers weekend workshops to local K-8 teachers throughout the school year. These programs link issues such as sustainability, organic-food production, water, and energy to California science-content standards and curricula. Throughout the year, teachers in grades 6-12 can join Academy scientists at either the Pepperwood Preserve, an hour or so away in Santa Rosa, or Stanford University's Jasper Ridge Biological Preserve, about the same distance from the Academy, for a day of field-based study. For more information on these workshops, check out the Academy Web site's Professional Development page or email Helena Carmena. Every spring and fall, the Academy hosts a daylong symposium for an audience of secondary school teachers called the BioForum, where international experts gather to discuss topics such as genetic engineering, conservation biology, or energy prospects in a changing world. The Academy's redesigned Web site provides numerous resources for teachers as well. "First, we created a special section just for teachers," says Topinka. Lesson plans and classroom activities, organized by grade level and thematically related to the exhibits, enable local teachers to extend their field trip experience with activities before and after the visit. The Academy also holds weekend workshops for K-8 teachers to learn how the new exhibits illustrate science concepts that state standards require teachers to cover. "We want to break out beyond our four walls so that teachers can have a museumlike experience in their classrooms," says Schufrieder. "We offer weekend workshops on our exhibits to help teachers get the most out of their field trip. We train them on how to use all the activities and specimens in the classroom resource kits. And with our redesigned facility, we now have an on-site classroom and wet lab where as many as 30 students can conduct hands-on science experiments." According to Carmena, the Teachers' Lounge section of the Web site will offer interactive content. "We want teachers to sign in and rate our lesson plans or to post photos of students with specimens or on a field trip," she says. "Our ultimate goal is for different schools in the Bay Area to collaborate on a project or idea. We'd like to see a dialog between schools -- say, all the third-grade students submitting their greenest ideas or posting their science projects online." The vision, adds Schufreider, is to increase science literacy for both teachers and students. "The ability to understand science and think critically about these issues means this younger generation will have more hope and excitement when thinking about the future."